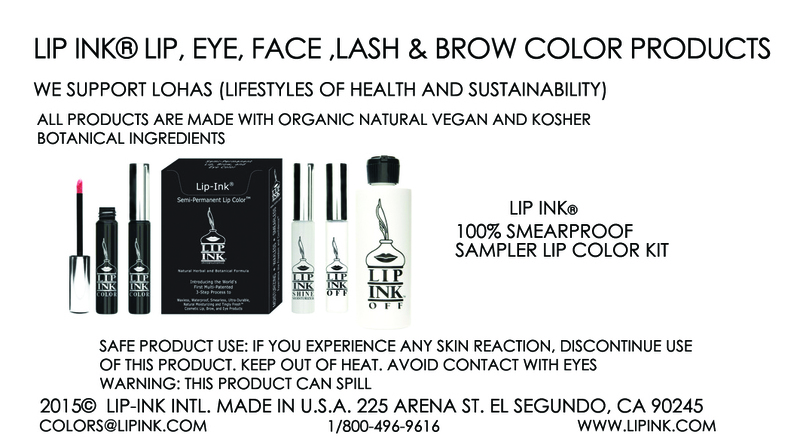 Our LIP INK® liquid lip stick system is cruelty-free and offers the latest innovation in smear proof technology. 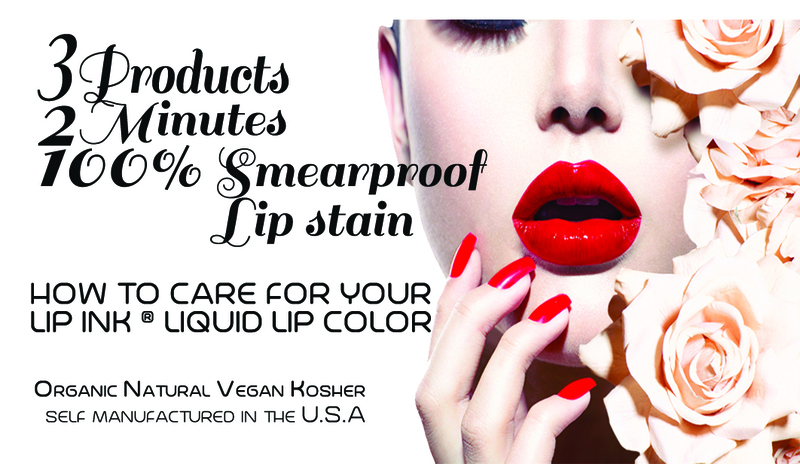 Unlike other all-day lip color and staining products, our unique three product smear proof liquid lip kits founded in 1995 are hand crafted in the U.S.A and formulated from natural botanicals that are organic, vegan, kosher, and they are wax-free and gluten-free. 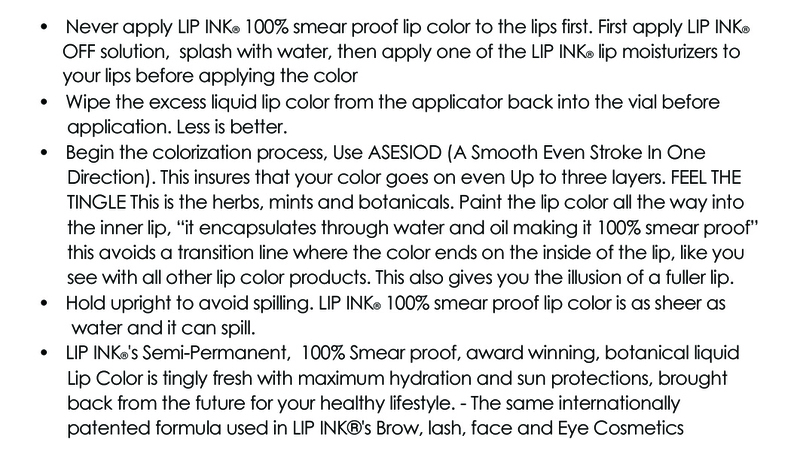 LIP INK®’s "Three Product System" is sold in the form of a kit. 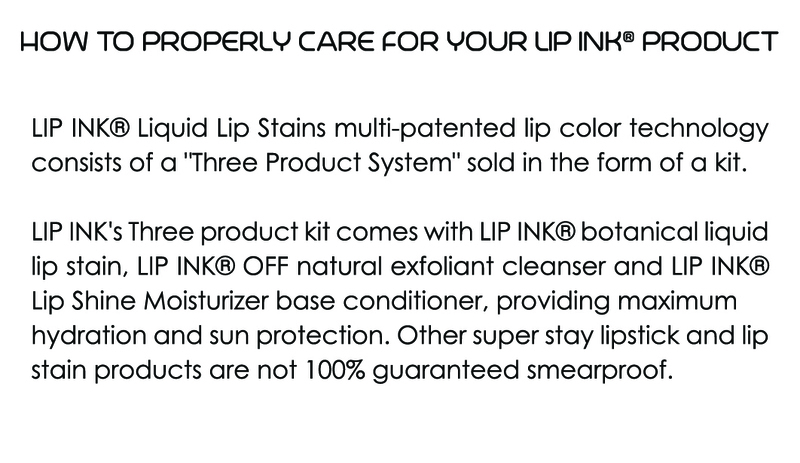 Our LIP INK® Lip Kit comes with LIP INK® botanical liquid lip stick, LIP INK® OFF natural exfoliating cleanser and LIP INK® Lip Shine Moisturizer base conditioner, providing maximum hydration and sun protection. 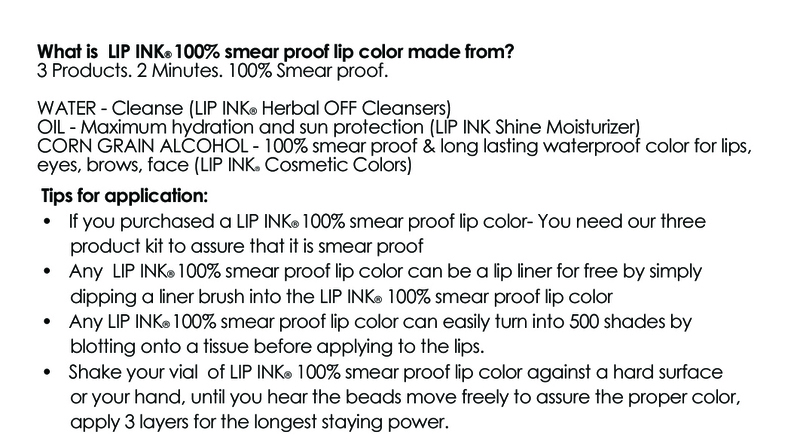 Other super stay lipstick and lip stain products are not 100% guaranteed smear proof and they create a drying effect while LIP INK® Liquid Lip Kits don’t need a sealant or lip gloss supplement for added moisture or color. 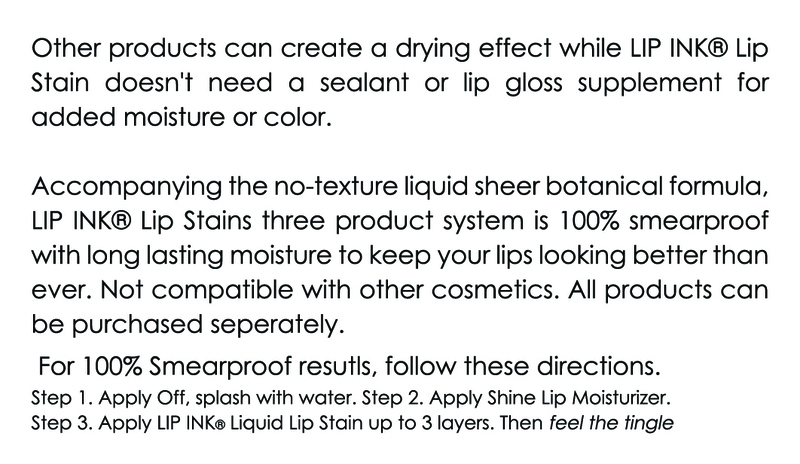 Accompanying the no-texture liquid sheer botanical formula, LIP INK® Lip Stains three product system is 100% smear proof with long lasting moisture to keep your lips looking better than ever. All these features are key ingredients to enhance your beauty regimen, your personal well-being, and your concern for a healthy sustainable lifestyle. With our smear proof lip kits, it's easy as 1-2-3 to have moist, healthy, hydrated lips. The entire process, from exfoliation to moisturizing to the dramatically finished look, takes just two short minutes. 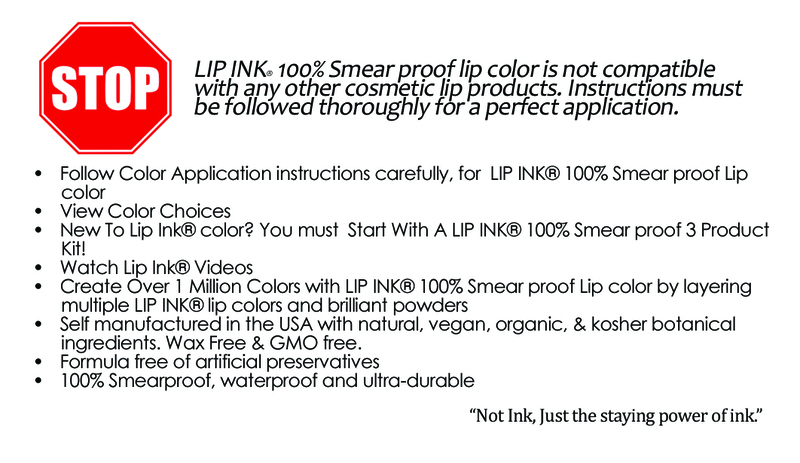 You get beauty, convenience and natural botanical ingredients all rolled into one amazing smear proof lip kit system. Not compatible with other cosmetics. 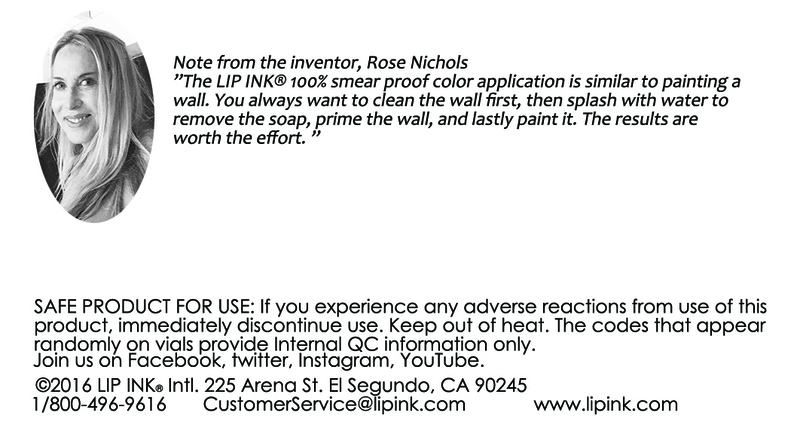 Copyright © 2014 Lip Ink Intl.. All Rights Reserved.